General Kalium files required to run the theme kalium.zip and optionally you can install child theme kalium-child.zip too. 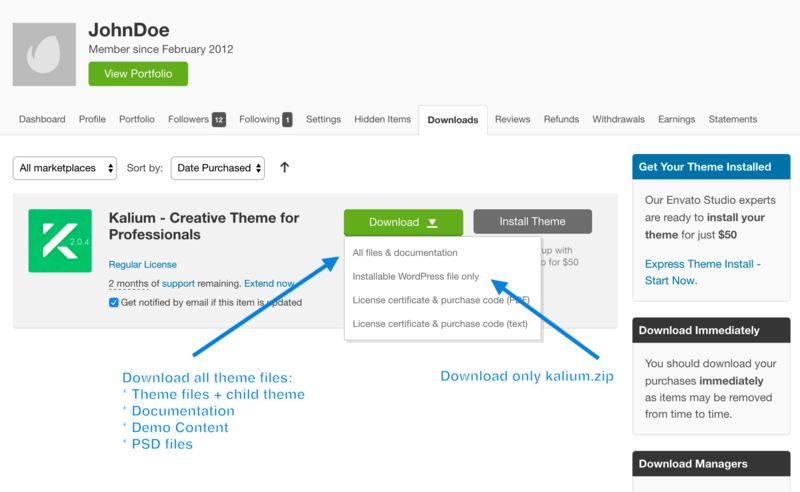 Kalium has 6 premium plugins bundled within theme files worth $170+. You don’t need to purchase them unless you want a personal copy for any of these premium plugins or you need to use any extra feature that the plugin can offer. To learn for what they are needed you can read this article. Premium plugins can be installed once the theme is activated (set as current theme in Appearances tab). To install premium plugins go to Appearance > Install Plugins. Documentation files are online based because Kalium has evolving development and may change from time to time. For quick access to documentation go to Kalium-Full-Package/Documentation and click index file. Apart from 1-Click Demo Content installer included in the theme, you can manually download latest demo content files from our online site here. To download demo content files you need to enter the purchase code. Same as with the demo content, the PSD files are stored online on our website. To download them you need to enter the Purchase code.